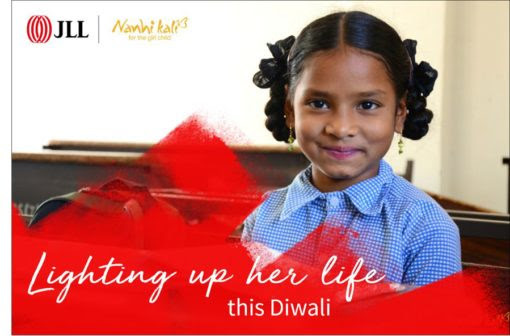 Mumbai, October 16, 2017: On the occasion of Diwali, JLL India - the country's largest real estate consultancy, supported by their staff has partnered with Project Nanhi Kali to fund the annual primary education of over 325 girl children from economically disadvantaged families in India. For this, the firm has decided to deploy the funds previously earmarked for client and employee gifting towards improving the lives of underprivileged girl children. Project Nanhi Kali is a joint initiative by the K. C. Mahindra Education Trust and Naandi Foundation. Effectively, JLL India will provide academic material to enable girl children to access quality education and attend school with dignity, and also the required social support to reduce the chances of them dropping out. Project Nanhi Kali works with 18 NGO implementation partners at the grassroots level, and the K. C. Mahindra Education Trust regularly monitors the activities to ensure that quality education is imparted to all the 'Nanhi Kalis' (young buds). JLL India's corporate social responsibility vision is to make continuous, meaningful and substantial contributions where they are needed the most. Given the express needs now being perceived on these fronts, this vision has now been sharp-focused on the strategic premises of Women Empowerment and Child Welfare, Reducing Child Mortality, Ensuring Environmental Sustainability and Vocational Training and Skill Development. Earlier this year, the firm pledged support to multiple CSR initiatives including the Behtar India Campaign to run dengue awareness drives, the Greensole Initiative to donate shoes to the less fortunate, and contributions to the Centre for Equity and Quality in Universal Education to help teachers improve their digital literacy skills. JLL is India’s premier and largest professional services firm specializing in real estate. With an extensive geographic footprint across 11 cities (Ahmedabad, Delhi, Mumbai, Bangalore, Pune, Chennai, Hyderabad, Kolkata, Kochi, Chandigarh and Coimbatore) and a staff strength of 9300, the firm provides investors, developers, local corporates and multinational companies with a comprehensive range of services including research, analytics, consultancy, transactions, project and development services, integrated facility management, property and asset management, sustainability, industrial, capital markets, residential, hotels, healthcare, senior living, education and retail advisory. The firm was awarded the Property Consultant of the Decade at the 10th CNBC-Awaaz Real Estate Awards 2015 and the Best Property Consultancy in India at the International Property Awards Asia Pacific 2016-17. Project Nanhi Kali was incepted in 1996 by the K.C Mahindra Education Trust with the objective of providing quality education to underprivileged girl children in India. Project NanhiKali currently provides education to over 130,000 underprivileged girl children across 12 states of India and believes that education is the single most powerful intervention for transforming lives. The objective is to stem the high rate of school drop outs amongst girls and provide support in the form academic, material and social support. Academic support is provided through classes where concepts of math and language are taught, material support is provided through providing the girl with schoolbags, shoes, books, uniforms, lunchboxes and other essentials that help a girl to go to school with dignity. Since 2005, the project is jointly managed by the K.C. Mahindra Education Trust and the Naandi Foundation.